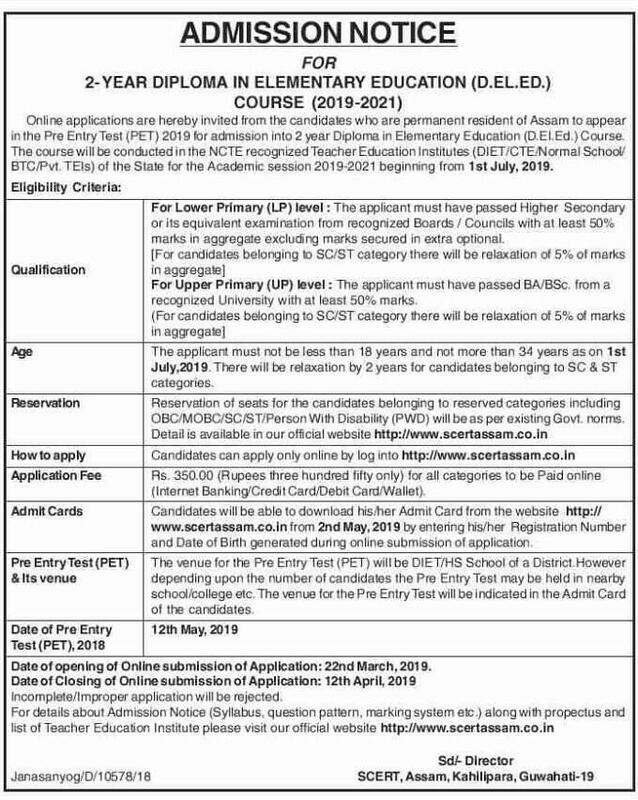 Online applications are hereby invited from the candidates who are permanent resident of Assam to appear in the Pre Entry Test (PET) 2019 for admission into 2 year Diploma in Elementary Education (D.El.Ed.) Course. The course will be conducted in the NCTE recognized Teacher Education Institutes (DIET/CTE/Normal School/ BTC/Pvt TEIs) of the State for the Academic session 2019-2021 beginning from 1st July, 2019. Age: The applicant must not be less than 18 years and not more than 34 years as on 1st July,2019. There will be relaxation by 2 years for candidates belonging to SC & ST categories. Admit Cards: Candidates will be able to download his/her Admit Card from the website http:// www.scertessam.co.in from 2nd May,2019 by entering his/her Registration Number and Date of Birth generated during online submission of application. Date of opening of Online submission of Application: 22nd March, 2019. Date of Closing of Online submission of Application: 12th 27th April, 2019.